England batsman Jos Buttler says there are still “places up for grabs” in the Test side after the tourists’ disappointing tour of the West Indies. England have consistently struggled with the bat and collapsed twice in Antigua as West Indies claimed an unassailable 2-0 series lead. The third and final Test begins in St Lucia on Saturday. “Sometimes that time away from the game and talking is just as valuable as the physical practice,” Buttler, 28, said. England coach Trevor Bayliss wanted to finish the West Indies tour with a settled top order. However, England dropped opener Keaton Jennings after the first Test for Joe Denly, who made six and 17 in Antigua. Buttler told BBC cricket correspondent Jonathan Agnew: “It’s fair to say for a little while now there’s been positions up for grabs. How worried should we be about England? England have yet to make 300 in an innings on the tour, and have suffered batting collapses in both Test matches. They batted for just 103.1 overs across their two innings in the second Test, as they were thrashed by 10 wickets inside three days. “International cricket demands you adapt to conditions and I think West Indies have done that really well and we’ve been found wanting,” Buttler said. “Darren Bravo [who batted for five hours in Antigua] really committed to setting his stall out and putting a high price on his wicket. England’s series defeat has seen them fall from second to fifth in the world rankings. All-rounder Ben Stokes missed Thursday’s practice with a bruised right heel, while there are also doubts over Chris Woakes and Ben Foakes. 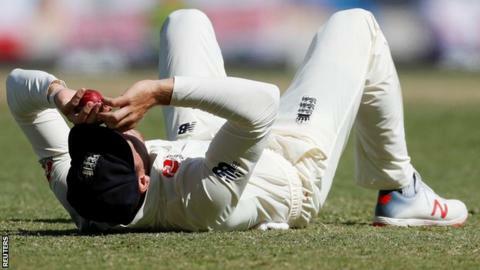 Wicketkeeper Foakes was replaced behind the stumps by Jonny Bairstow during the West Indies innings in Antigua, after injuring his hand while batting. Warwickshire bowler Woakes has yet to play in this series after struggling with a knee injury.